“When the shot went up, I knew I needed to crash the boards,” Daniel Purvlicis said. 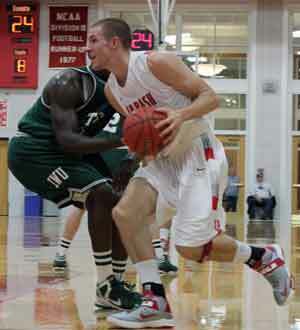 That was his last thought before scoring a game-winning tip in for Wabash against Albion College. The freshman forward made the play in the final seconds to give his team its first win of the season. Purvlicis has continued to shine on the court; he's averaged 8.3 points per game while shooting over 50 percent and has started every game. Purvlicis is part of the youth infusion to the basketball team. Four of the five starters are a sophomore or younger, including two freshmen (Purvlicis and guard Ross Sponsler). Purvlicis has noticed two main differences from high school basketball. At 6-foot, 7-inch and 235 pounds, junior center Pete Nicksic bangs on everyone in his way, including Purvlicis. At a wiry 6-7, 198s, he hasn't shied away from taking Nicksic on in the post. Purvlicis and fellow freshman big man, center Marcus Kammrath, practiced one on one moves versus Nicksic before training camp practices. Purvlicis didn't wait for school to start before he built a relationship with his new teammates. Purvlicis, Sponsler, Nicksic, and a handful of other Wabash basketball players attended a summer tournament in Indianapolis against other teams that consisted of men and other collegiate athletes. The tournament's benefits transcended the playbook for Purvlicis. The extra time spent with his teammates has paid off for Purvlicis. He has become more of a vocal leader on the court despite only playing in six games. Purvlicis's credits his high school coach Dave McCollough for his high basketball IQ. Purvlicis started as a sophomore for the Noblesville Millers. His team made regionals that year and Purvlicis was exposed to top-level competition. His most notable high school opponent is Gary Harris from Hamilton Southeastern, who is now a starting guard for Michigan State University. Purvlicis had some success against the McDonald's All-American. The top-level competition Purvlicis faced in high school also included players who are playing basketball for Indiana University and Kansas State University. Purvlicis faces just as big of challenges off the court as well. As a freshman in the Beta house, he's enduring the challenges of pledge ship. He currently plans to major in rhetoric with a minor in economics. Grades aren't the only thing coaches are big on; they're also big on Purvlicis. Carpenter sees a bright future for him.